"The Trinity is truly a mystery. This doctrine teaches that the God of Christianity is one in His essence but three in His persons?the Father, the Son, and the Holy Spirit. Though the word Trinity is not found in the Bible, there is no doubt that the Scriptures teach this triune nature of God. Yet the concept still challenges our finite minds. In this Crucial Questions booklet, Dr. R.C. Sproul carefully explains the doctrine of the Trinity, stressing that Christians worship one God who manifests Himself in three distinct persons. He shows what the Bible teaches and outlines the chief errors on this doctrine that have afflicted the church. Above all, he affirms that while this truth is difficult to understand, it is not contradictory. Rather, it is a beautiful expression of the biblical teaching on the nature of God." What Is The Trinity? by Sproul, R. C. was published by Reformation Trust in June 2016 and is our 6457th best seller. 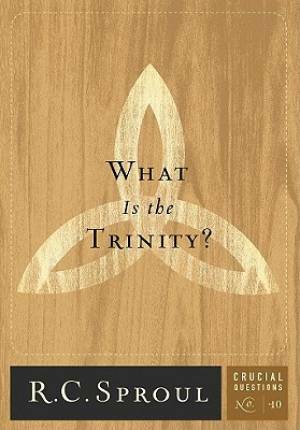 The ISBN for What Is The Trinity? is 9781567692594. Reviews of What Is The Trinity? Be the first to review What Is The Trinity?! Got a question? No problem! Just click here to ask us about What Is The Trinity?. Details for What Is The Trinity?